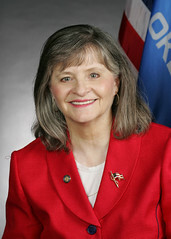 A couple of things stand out right now in the recent and ongoing Kern kerfuffle over state Rep. Sally Kern’s racist and sexist remarks last week on the floor on the Oklahoma House of Representatives. First, even many Republicans publicly agreed Kern, an Oklahoma City Republican, had crossed a line when she essentially called African-American people lazy and looking for a government handout and when she described women as not as focused on their jobs as men. Kern made the remarks over debate on ending affirmative action in Oklahoma. It doesn’t get more ugly than that. Republicans and Democrats voted 76-16 Monday to reprimand her. Kern apologized and claimed she misspoke. But her remarks reflected a type of typical and stereotypical hate speech that seemed more learned than suddenly rhetorically inappropriate. Looking for a reason for a possible Thunder stumble against the Memphis Grizzlies in the NBA playoffs? What if players on the Oklahoma City team now realize or are reminded they’re playing for a lot of fans that send racist politicians, such as Kern, to office. Frankly, in the context of Kern’s remarks, it’s kind of eerie watching Thunder fans-all dressed in the same T-shirt-chanting in unison and closely following cues from the public address system. It’s a metaphor. In any event, Kern’s apology and reprimand aren’t enough. If Kern were truly apologetic, she would resign and begin some type of program to explore her basic intolerance of what seems to be at this point all groups of people, except for white, straight men. She might try to understand what drives her intolerance. If she can redeem herself, then that’s great. She can always run again for office again. But right now her very presence at the state Capitol is offensive to many people, harmful to the state’s image and suffocating to open-minded people here.